Lazytown, takes a high action crack at Children and healthy lifestyle, and makes a new market in educational children's media! Finally a show that's tackling the issues! Lazytown, is a children's television show adapted from a successful play from Iceland. Icelandic gymnast and role model Magn��s Scheving, conceived Lazytown as an effort to combat obesity, and inactivity in kids. The show has been globally sucessful; in the Uniyed States it has landed primary slots on Nickelodeon channels, and CBS Saturday morning programming. The themes of the show are very positive and attractive to children. The shows target audience age is 4-7. The plot involves main character Stephanie visiting her uncle in Lazytown. Upon arrived she displeased with laziness and negativity of the town and tries to encourage change. Stephanie is a very attractive character for young girls. She promotes gender stereotypes with her pink hair and matching feminie accessories. She also has many singing breaks, and dance modeled like a pop star music video. Her dance moves resemble aerobics and often start to involve the whole town in exercise fashion. The superhero of Lazytown, is Sportacus (played by Magn��s Scheving). He immediately agrees with Stephanie about making a change. Sportacus is naturally the admirable character for boys. He wears a blue jumpsuit, and is excellent in every sport. He uses gymnastics to get from place to place. The antagonist is Robbie Rotten, who employs all the schema of cartoon villany, right down to the evil laugh. Robbie uses temptation to align the townpeople to his side of laziness, selfishness, junkfood, and trouble. The townspeople are of diverse gender and ethnicity. Each have their vices, which make up most of their personality. The ones with most appearances are Stingy (selfish), Ziggy (candy), Trixie (mischeif), Pixel (Video Games). Through misadventures all the townspeople overcome Robbie Rotten's temptation and learn moderation and healthy lifestyle tips from Stephanie and Sportacus. Parents can use the townspeople and their lessons in moderation as an example for their own children. I witness my own cousin turn off video games saying he played too long, and referenced a plot from the show. The only live action characters in the show are Stephanie, Sportacus, and Robbie Rotten, which give them grave importance in a show with CGI background and puppet supporting characters. The show uses lighiting fast jump cuts, and speed up motion speeds, sublimnally expressing high activity. The shows techno music and bright colors, seemingly raises pulses in kids. Watching this program with my younger cousins, it wasn't long before they were jumping along with the program. The uses of editing to evoke this reaction helps with the overall goal of the program. The catchy pop songs in every show usually have lyrics that push the shows moral. There isnt any commercialism in the show, which is a breath of fresh-air. The only thing show seems to endorse is "Sport Candy", which is just fruits and vegetables. The continue use of the "Sport Candy" phrases makes me think that they could use it to appear on a brand of fruit and vegetables, however there is no blantant brand marketing. For a show, with a classic good vs. evil theme, there is no violence whatsoever. Robbie Rotten is usually defeated after losing in some physical game or activity. He often gets tired and retreats home. I enjoyed the lack of pain, and humilation in the show. The viewer still understand the Good has conquered evil without anyone getting hurt emotionally or physically. The cicrumstances are usually realistic, with common consequences. However, Sportacus numerous acrobatics don't frequently come with a "Im a professional, don't try this at home" disclaimer. I enjoyed my viewing of Lazytown, and find the use of plot, characters, and setting a lot more effective in encourage activity, than the surrealism of Boohbah. I think as long as Lazytown, stays true to mission, and doesn't surrender to branding and heavy merchandising, it will do a lot of good. I commend Magn��s Scheving for his endeavors. The show is needed, as physical education slowly declines in schools. Finally, a kids show that doesn't make me fall asleep. My 4 year old daughter's new favorite show!!! One day, as she was watching Lazytown, my 4 year old, ran in the kitchen to grab a bag of mini carrots. She proceeded to eat them as a result of the "healthy eating" lesson from Lazytown. In addition, she is always active (cartwheels, jumping, etc.) during Lazytown. For Halloween, she wants to be beautiful pink-haired Stephanie. "LazyTown" is a show marrying live-action and animation, a fairly recent port to the United States from Iceland. It's part of the new breed of children's animated programs these days --- programming especially focused on making viewers "get up and go" and as far as this goes, it's at the top of its game. "LazyTown" features a human girl, Stephanie, a human hero, Sportacus and his human nemesis, Robbie Rotten. The rest of the characters are CGI animated and quite well too. The setup is this --- generally in each episode, Sportacus (advocate of getting up and going) battles the plots and schemes of Robbie Rotten (trying and endlessly failing to make those in LazyTown lazy, also a master of disguise.) He just can't stand all the activity in LazyTown, but usually ends up expending a lot of energy himself trying to stop it. The simple fact is, no one's lazy in LazyTown anymore, largely thanks to Stephanie, an energetic girl with bubble-gum pink hair. She's still fairly new in town and living with her Uncle, Mayor Meanswell. Her group of friends is Ziggy, Pixel, Trixie and Stingy. "LazyTown" is loaded with high energy, fun songs. The opening theme and "funny words" songs can be heard in every episode and there's also at least one other new song in each one. 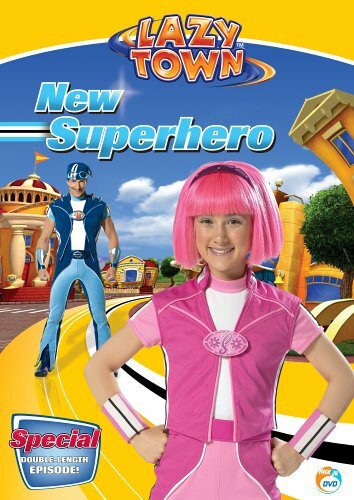 This DVD features three episodes of the show, including a special double-length episode --- "LazyTown's New Superhero." This one plays around with the format a bit, as the kids decide to give Sportacus a vacation. While Sportacus struggles to relax and take it easy, Stephanie does her best to become the new town superhero. Also included in this DVD are "Cry Dinosaur," in which Robbie Rotten dresses up as a dinosaur to scare "Sporta-Crybaby" and "Dr. Rottenstein," in which he tricks the kids into believing they have spotty vegetitis and must swear off vegetables and eat nothing but junk food. Not only that, but under the guise of Rottenstein, he bans Sportacus from LazyTown "forever," another one of his old tricks. Well I didn't think it was possible but I believe Sportacus has replaced Dora on the top of my 23 month old daughter's favorites list. She has to watch this DVD at least once a day. I really enjoy this program too since it promotes healthy habits and has very charming characters. It helps that Magnus Scheving is easy on the eyes too! Such a wonderful show with a nice Icelandic touch. How can we go wrong? An awesome show just in theory, now you and your child can exercise with Sportacus, Stephanie, Robbie Rotten, and the LazyTown crew at home! The story plot is that Stephanie and the gang want to give Sportacus a day off since he always helps everyone in LazyTown when they need it. Stephanie takes over for a day, and Robbie Rotten concieves a dastardly plan to rid LazyTown of Sportacus forever. He makes a robotic dog to cause mayhem in LazyTown and in turn, it makes Sportacus and "Sportasteph" team together to save the day! am i too old to be watching this??? well im 23 n started watching this for something to do when feeding my 9 wk old daughter in the mornings, and what can i say....... i love it. i have downloaded the songs 4 my nieces n nephews n must admit i do listen to them myself. finally a children's show I can be entertained with! Lazytown is an amazing mix of animation, computers, puppets and real people all pulled together in a colorful creative way! My five year old is in awe and jumps up to dance and move around with them in all their routines. I laugh, my husband laughs, my teenager laughs. Very creative and energetic show. This particular episode aired on 8/15/05 in the afternoon/evening and is now available to bring home on DVD. LazyTown is a great new childrens show that will entertain everyone! Parents can sit and watch with their children and not be bored out of their mind. The children will be in a daze and jumping up and down. New Superhero is the main episode in which Sportacus, a superhero, has to take a break. His pink-haired friend Stephanie takes over just in case Robbie Rotton shows up. He does. This episode is double length and will have kids up and down the whole time. This episode also shows a very important message as Sportacus doesn't like his vacation. He wants to get up and be active. It shows that being outside playing is more fun than doing nothing. This seems odd because it is promoting not to watch tv? Don't be worried though, because LazyTown has your kid be active the whole time. They do different and fun routines and encourage the kids to join along. During parts of the show there is a little fun meter at the bottom of the screen. You get it to go up by jumping and dancing and just being active. There is also a big lesson on how eating a healthy breakfast gives you energy for the day. This dvd also includes two other episodes. Cry Dinosaur where Stephanie and Ziggy have their first campout. Ziggy is afraid that dinosaurs will come, but at the end he has to overcome his fears to save the day. A good message that you can't let fear hold you back from what you love. Dr. Rottenstein is the other. In this the kids are growing vegetable gardens and Robbie Rotton convinces that everything healthy should be banned. Soon everyone is affected by this horrible diet. It is up to the kids to save the day. Great entertainment for 2-6 year olds. For those not familiar with the popular kid's show, Lazytown is a place where the citizens preferred not to do any kind of strenuous activity until the arrival of Stephanie, an energetic young girl with bright pink hair, and Sportacus, the super fit, super strong, weirdly mustached superhero who lives in a sort of blimp-like airship. Soon Stephanie and Sportacus have the residents on the right track to good health, exercise, and fruit and vegetable consumption, punctuated by upbeat pep rally type songs and spine bending dance steps. This does not meet the approval of the town bad guy, Robbie Rotten, who spends his days plotting the undoing of Sportacus, with various ingenious and despicable schemes. Previously only viewable on television, this DVD allows kids to watch favorite episodes over and over again, and introduces a double-length episode where Sportacus is given a forced vacation while Stephanie takes on the Superhero role. There are two previously aired episodes on the DVD - one where Robbie dons a dinosaur disguise to scare Sportacus, and one where he disguises himself as a doctor and makes them stop eating vegetables. With a combination of real actors and puppets, this is a very positive family oriented show, advocating good living habits, mixed with song, dance and humor. Highly recommended for anyone with kids between 2 and 6 years old, even though many adults may find it a little cheesy. To be honest, I am actually 13 years old and I'm a HUGE Lazy Town fan. No, I don't have any younger brothers, sisters, cousins, anything like that. And I don't babysit either. I started watching the show on my own free will. Now that that's out of the way...Lazy Town is an amazing show. The songs are so catchy and upbeat, it has a great message, Stephanie's such a cute character, Robbie Rotten can really make me laugh. There's so many great things about it.